Westwood Gallery NYC in collaboration with Boris Lurie Art Foundation presents an exhibition of paintings, collage and sculpture by Boris Lurie, co-founder of the NO!art movement. In 2010 the gallery exhibited Boris’ early work, the first solo exhibition after the artist’s death. The current exhibition comprises a curated selection by James Cavello of over 50 works of art from the 1950s to 1970’s. Boris’ early 1950’s paintings on dark backgrounds are reminiscent of German Expressionism with disproportionate, sometimes deformed fading images of women. On exhibit are four large paintings with groupings of two and three women. The female image was symbolic of life, family, death, sexuality and objectification. Boris’ collages using pin-ups from ‘girlie’ magazines were startlingly incorporated into Holocaust photographs. The shock of the combination of images stemmed from Boris’ malevolence and art purge of crimes against humanity. Boris’ free form expression without commercial motivation. They encompass the artist’s views on politics, society, art, personal experiences and visceral expression. 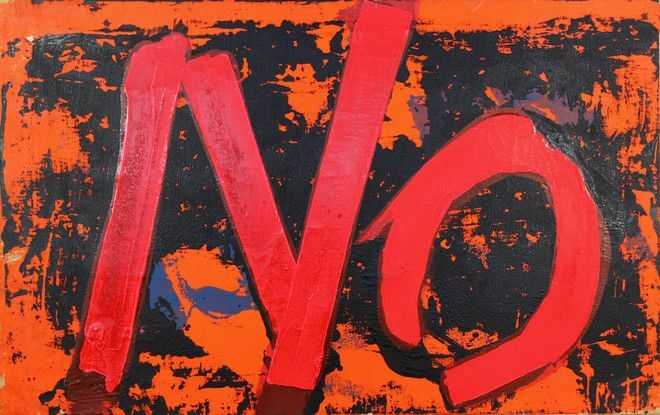 At the time, NO!art was largely rejected by art critics, museums and collectors, until the artists and artwork of NO!art became more understood in the historical context. Also included in the exhibition are a series of 1963 collages fixated on altered images of the establishment male in a tie with faces painted over and a grouping of 1970’s assemblages of bras, corset and Israeli flag, symbolic of Boris’ intrinsic language.